At Charity Navigator, we evaluate, for free, more than 8,000 charities. That’s more organizations than anyone else in America has ever attempted! But with more than 1.4 million nonprofits in America, there are many that do not meet our criteria for evaluation or that we simply haven't been able to rate yet. So when our users searched for a charity they were interested in, sometimes they would find no information at all on our site. Now, donors searching our site for their favorite local charities, newly formed charities, or other organizations we haven’t yet rated, can confirm the nonprofit status of such groups and access tips for conducting their own due diligence. * That’s because Charity Navigator’s website has expanded to include all 1.4 million nonprofits that have registered with the Internal Revenue Service. This 1.4 million is comprised of more than 30 different types of nonprofits which include health, advocacy groups, labor unions, professional associations, private foundations and more. But the focus of Charity Navigator is the largest of these 30 types --- the 501(c)(3) public charities. They total nearly 1 million, represent almost two-thirds of the registered nonprofits in America, and are the ones for whom donations are tax-deductible. With this expansion of Charity Navigator's database, visitors to our site will now see two sets of search results: Rated Organizations and Unrated Organizations. Rated Organizations are the public charities that Charity Navigator’s professional analysts have evaluated. Clicking on those charities’ names will display their full rating analysis. 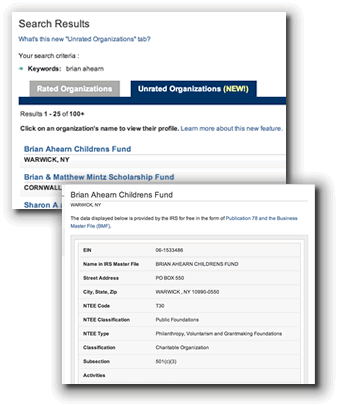 Unrated Organizations are nonprofits registered with the IRS that match your search criteria. Clicking on those organizations’ names will display basic information that the IRS has on file for the group, including what type of nonprofit it is. A subset of these, roughly 14,000 or so, meet our criteria for evaluation and will ultimately be rated by Charity Navigator. Registered users will be able to view Forms 990 and search by cause area. For the subset of nonprofits that meet our criteria for evaluation, registered users will have the opportunity to vote for those that they would like to see Charity Navigator rate. In the meantime, potential donors can follow our tips to do their own due diligence on charities not yet rated by us. Users will be able to donate to non-rated charities, either singularly or by including them in a giving basket with other rated and/or unrated charities. Registered users will be able to ‘save’ unrated organizations to their ‘My Charities’. Unrated charities and other nonprofits will have the ability to log into the site and update their basic information, such as contact information. In the meantime, nonprofits can make such updates by contacting the IRS directly. It will provide our users with the most concise and user-friendly information available on the entire nonprofit sector in America (as well as globally since the scope of work for many of these charities is international). It will educate our users on the wide variety of types and sizes of nonprofit organizations. It will empower our users to conduct their own due diligence on nonprofits not rated by us, to donate to any organization they determine is worthy, as well as provide an opportunity to write a review of any US registered nonprofit and thereby assist others with their charitable giving/ social investing decisions. It will also empower our users to help us select the next group of public charities to rate. We have set a goal to double the number of public charities we rate by 2016, at the rate of 1,000 per year. Our registered users will be able to help determine which organizations should be a priority. In conclusion, we believe that this expansion critically aligns with our mission to be a guide to intelligent giving. We are excited to be able to offer this new feature to you and hope you find it as useful as we intend it to be. Please let us know what you think of it and any suggestions you may have to further enhance the information we provide by emailing us. *We don't rate charities that have less than $1 million in revenue (only about 4% of all donations to the nonprofit sector each year go to charities of that smaller scale) and we are not able to rate charities that haven't been in existence for at least 4 years. Visit the Methodology section of our site to learn more about our criteria for selecting charities to rate.